Electronegativity is one of the most well-known models for explaining why chemical reactions occur. Now, Martin Rahm from Chalmers University of Technology, Sweden, has redefined the concept with a new, more comprehensive scale. His work, undertaken with colleagues including a Nobel Prize-winner, has been published in the Journal of the American Chemical Society. 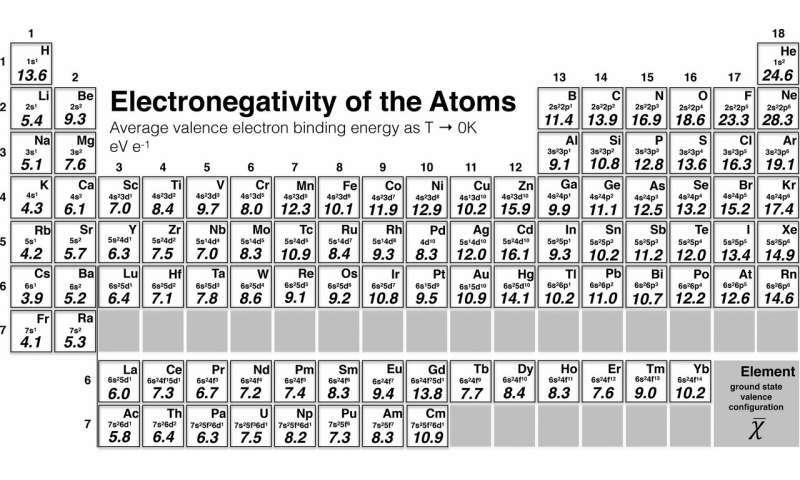 The theory of electronegativity is used to describe how strongly different atoms attract electrons. By using electronegativity scales, one can predict the approximate charge distribution in different molecules and materials, without needing to resort to complex quantum mechanical calculations or spectroscopic studies. This is vital for understanding all kinds of materials, as well as for designing new ones. Used daily by chemists and materials researchers all over the world, the concept originates from Swedish chemist Jöns Jacob Berzelius' research in the 19th century and is widely taught at high-school level. Now, Martin Rahm, Assistant Professor in Physical Chemistry at Chalmers University of Technology, has developed a brand-new scale of electronegativity. "The new definition is the average binding energy of the outermost and weakest bound electrons—commonly known as the valence electrons," he explains. "We derived these values by combining experimental photoionization data with quantum mechanical calculations. By and large, most elements relate to each other in the same way as in earlier scales. But the new definition has also led to some interesting changes where atoms have switched places in the order of electronegativity. Additionally, for some elements this is the first time their electronegativity has been calculated." For example, compared to earlier scales, oxygen and chromium have both been moved in the ranking, relative to elements closest to them in the periodic table. The new scale encompasses 96 elements, a marked increase from previous versions. The scale now runs from the first element, hydrogen, to the ninety-sixth, curium. 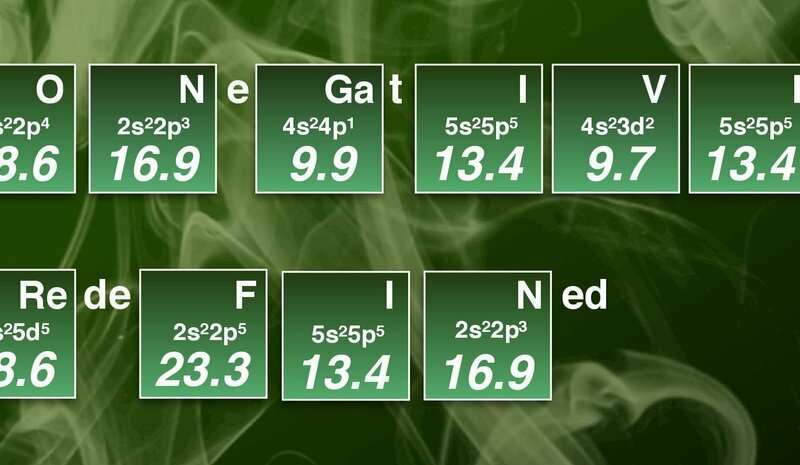 One motivation for the researchers to develop the new scale was that, although several different definitions of the concept exist, each is only able to cover parts of the periodic table. An additional challenge for chemists is how to explain why electronegativity is sometimes unable to predict chemical reactivity or the polarity of chemical bonds. A further advantage of the new definition is how it fits into a wider framework that can help explain what happens when chemical reactions are not controlled by electronegativity. In these reactions, which can be hard to understand using conventional chemical models, complex interactions between electrons are at work. What ultimately determines the outcomes of most chemical reactions is the change in total energy. In the new paper, the researchers offer an equation where the total energy of an atom can be described as the sum of two values. One is electronegativity, and the second is the average electron interaction. The magnitude and character of these values as they change over a reaction reveals the relative importance of electronegativity in influencing the chemical process. There are endless ways to combine the atoms in the periodic table to create new materials. Electronegativity provides a first important indicator of what can be expected from these combinations. "The scale is extensive, and I hope it will greatly affect research in chemistry and material science. Electronegativity is routinely used in chemical research and with our new scale a number of complicated quantum mechanical calculations can be avoided. The new definition of electronegativity can also be useful for analysing electronic structures calculated through quantum mechanics, by making such results more comprehensible," says Martin Rahm.